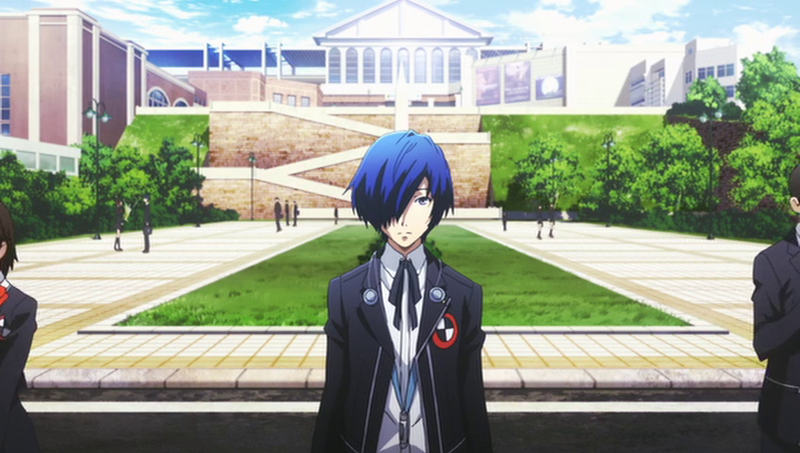 If you aren’t familiar with Persona 3, I’ll give you a quick run-down. The protagonist, named Makoto Yuuki in the movies, arrives at Tatsumi Port Island in the middle of the night, as he is transferring to a nearby high school. 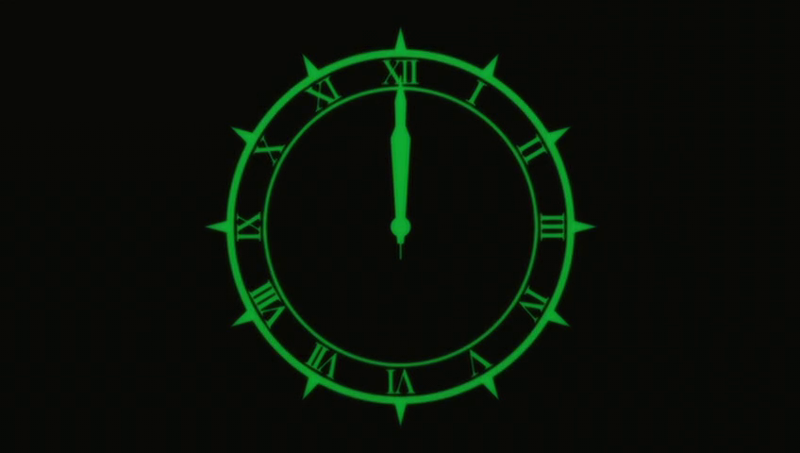 As the clock strikes 12, everything around him changes – normal humans are replaced by massive coffins, the moon glows an ominous yellow, the surroundings are all tinted a green color, and puddles of blood are visible everywhere – this is the Dark Hour, a period of time hidden between days that only a few can perceive. A few days later, the protagonist gains control of a Persona, a mysterious power that allows him and a select few others to summon supernatural entities to fight against the Shadows that target humans during the Dark Hour. 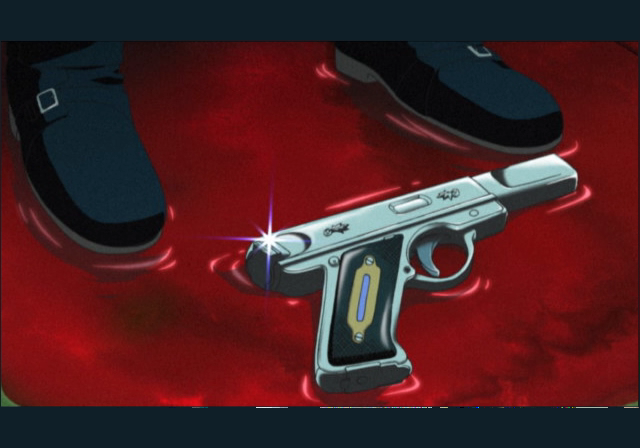 The method for summoning their Personas is the Evoker, a gun-like object that forces out their Persona. The group of Persona-users spend the next few months working together to stop the Shadows at their source and save humanity. First, I’ll talk about the things I enjoyed in comparison to the game. For one, this movie looks great. 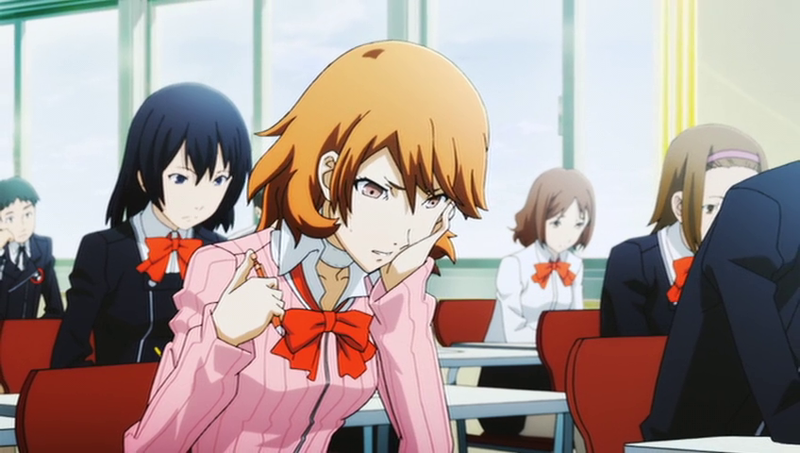 While this was done by the same studio that did Persona 4 The Animation, it looks substantially better. 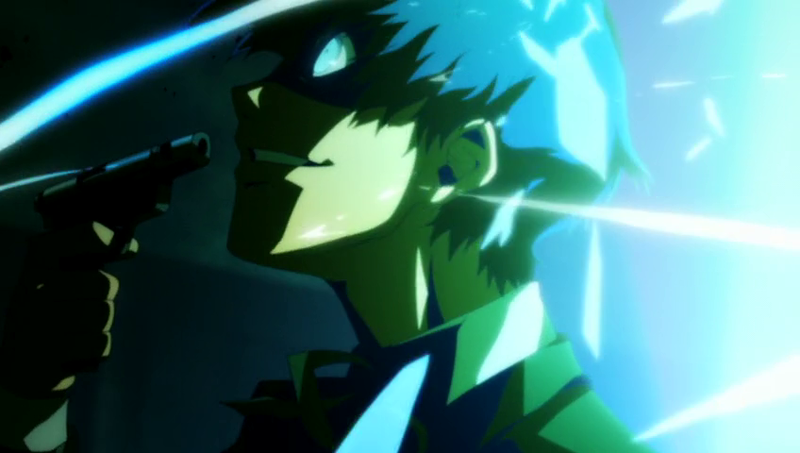 And compared to the meh animation from Persona 3‘s cutscenes, the movie’s animation is certainly fantastic. Character designs are also improved across the board, as characters no longer have uncomfortably long necks, gradient faces, or minuscule pupils. Fuuka and Yukari both look significantly better than they did in the game (especially Fuuka), but most of the other characters look as I’d expect them to. Based on the promotional stuff, Aigis looks much better as well, so that’s just one of the reasons I can’t wait to see the next movie! They brought back a ton of music from the game, which is a welcome decision. Hearing Deep Breath Deep Breath, Master of Shadow, and several other tracks in the movie is simply awesome. The protagonist riding into Tartarus on a motorcycle while Mass Destruction kicked in is easily one of the coolest parts of the movie, even if it is a short-lived event. Unfortunately, while some tracks are used at the same points in the story as they were in the game, some have been replaced by new music. Somehow, despite being written by the same person, this new music is nowhere near as effective as the original tracks (I had this same complaint with Persona 3 Portable‘s new music for the female protagonist). And maybe I’m just too familiar with the music endlessly repeating in the game, because several of the songs sound as if they are cut short far too quickly. They nailed it with Makoto’s first summoning of Orpheus. If his expression in the above screenshot doesn’t give it away, his state of mind is a bit strange when he first does it – throughout the movie, he is mostly indifferent to death, which is why he has no issues with using the Evoker before he knows what it actually does. As a whole, I like what they’ve done with his character development, and I’m sure that Aigis joining the story will influence it as well. The battles were never anything amazing to watch, but the first time the characters go into Tartarus is a bit nostalgic (which is weird, since I first played the game less than a year ago). Seeing the characters test out their Persona’s abilities and begin to work together in battle gives a good introduction of how Personas work and what the team dynamic is like. While most of the game is devoted to fighting your way to the top of Tartarus, the movie has barely any exploration of it, which is certainly understandable. This isn’t really a con, but watching the movie without English subtitles made me focus on the voices more than normal. Since I played the US release of the game and am familiar with the English VAs, I was looking forward to hearing their Japanese counterparts. As a whole, I think Mitsuru, Yukari, and Elizabeth sound better in English, but Akihiko, Shinji, and Fuuka sound better in Japanese. Especially Fuuka. Makoto’s voice is about what I expected it to be. A lot of the imagery from the game is retained, and some of it that isn’t should have been. One example that carries over to the movie is the shattering clock. During the game, every time the Dark Hour comes, it shows the clock shatter when it hits 12am. In the game, this is an easy way for the developers to transition into the green-tinted Dark Hour, but in the movie it feels a bit pointless. Simply showing a normal clock as it becomes 12 o’clock would be a better way to do it, if the color shift itself isn’t adequate. On the opposite end of the spectrum, the Dark Hour blood puddles aren’t as prolific as they should be. If you’ve played the game, you probably remember the first full moon, when the protagonist first summons his Persona on the dorm roof. In the game, Yukari’s Evoker lands in a puddle of blood, which were all over during the Dark Hour, and the protagonist picks it up from there before using it. Unfortunately, the ground at his feet is dry in the movie. While I think they nailed Makoto’s actual summoning of Orpheus, the lead-up (and follow-up) lacks the ominous tension from the game. Obviously, this isn’t from the movie. I didn’t expect to complain about this, but they sort of ruined Thanatos’ appearance. 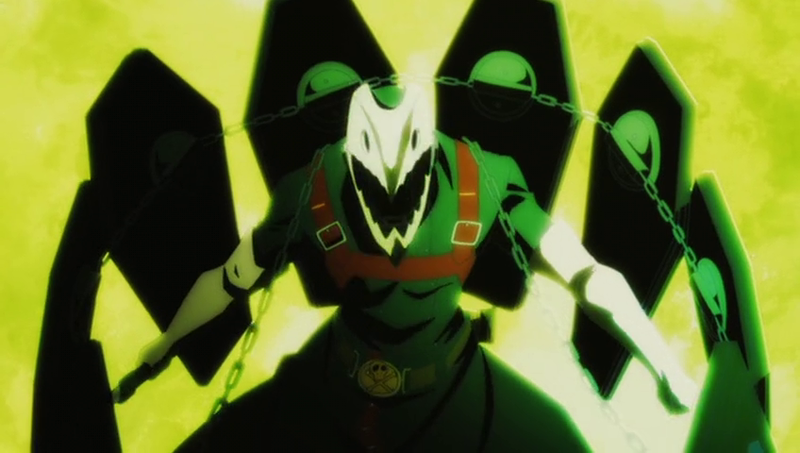 In the game, shortly after summoning his Persona, Orpheus, the protagonist looks as if he’s in pain, and then Thanatos (a different Persona) literally rips Orpheus apart from the inside out before destroying the Magician Shadow. In the movie, it looks as if Thanatos simply crawls out of Orpheus and tears the clothing apart – basically, the scene is severely lacking. Not to mention that this happens pretty much immediately in the game, but in the movie is postponed for a short battle, which is pretty pointless. And rather than pummeling the Shadow into a messy pulp, Thanatos just slashes it in half pretty quickly. Note: Persona 3 Portable did a terrible job with this scene as well, but that’s just because they completely omitted the anime cutscenes and opted for machinima. The biggest issue with this movie (besides being rushed) is that the overarching conflict of the game’s story is still not set up yet, and as a result the “climactic battle” is far too drawn out, making a situation more dramatic simply because they need to end the movie with some kind of bang. In the game, the Emperor/Empress battle is fairly straightforward once Fuuka joins the team, as she is able to tell you their resistances and weaknesses, making for a pretty quick boss fight. In the movie, they manage to make this take longer than it did in game. And as a random thought – while it may just be the result of the drastic contrast in lighting between the Dark Hour and daytime, everything seems way too bright during daytime events. Of course, I was watching this in poopy quality (since I decided against pre-ordering it for some stupid reason), and for whatever reason there aren’t any blu-ray rips floating around yet, so it might not actually be an issue with a higher quality video. As a fan of the game, I think that this is a good adaptation of the story, but way too rushed. It looks great, sounds good (but not as good as it should), and I’m still looking forward to the next few movies. I don’t know if they even said how many it will be, but at this rate, it will be comprised of three or hopefully even four in total. Obviously, they had to cut plenty of things from the game, but could they seriously not make the movie longer than 90 minutes? I don’t think people’s attention spans are so short that another half hour would change too much. And I doubt that an additional half hour would drive up the budget so much that it wouldn’t be worth the effort. Social links barely played a role in the movie, so an extra half hour or so for them would be very welcome, both to bring those characters into the story and to help with the pacing. Recommendation: If you’re familiar with the game, give it a watch. Otherwise, wait for the other movies before watching it. 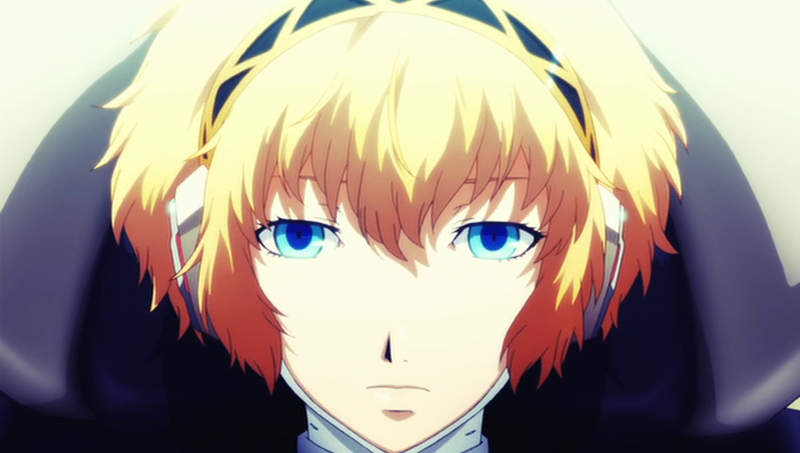 Did I mention that I’m excited to see Aigis in the next movie yet? I have two Persona-related posts coming soonish – my review of Persona 3 FES, and one that I might hold off on for a bit/merge with something else – what I want from Persona 5. And, uh, Rise is going to be a playable character in Persona 4 Ultimax. That was quite the surprise. Now we just need to wait for the surprise Adachi announcement. Or (being way too optimistic here, but it’s certainly a possibility based on Elizabeth’s story in Persona 4 Arena) Makoto, although he would be better as an in-game surprise. It’s doubtful. But seeing that Junpei and Yukari were added to the roster, and that the characters are apparently going to end up in Tartarus in the game (I don’t know how or why), the story may wrap around to Persona 3. I can hope. If they don’t do something to properly conclude Elizabeth’s story, I’ll be ticked. My main issue with Arena is that the story was only half-baked, but it looks like they’re going for an all-out attack with Ultimax. Hooray! As a lover of giraffes I am disappointed to learn of the new character designs. There are no Blu-Ray rips floating about? No surprise. They are selling the disc for silly money. I want to watch the movies although I am disappointed that they didn’t just make a twenty plus episode anime, which would prevent them having to rush through the material. Aniplex is publishing it, so the high price is no surprise. Even then, it’s been a week since the release in Japan and there still aren’t any BD rips online, which is certainly not the norm. I’m a bit surprised they opted for movies for a few reasons – P3 is definitely not as popular as P4, and the movies must have a higher production cost than P4’s TV series. I guess ticket sales really boost the income. Either way, I agree that P3 would work better as a typical series. In fact, I think it would work far better than P4 did, mainly because the main plot would be naturally spread out by the monthly events. The result probably wouldn’t be as pretty as the movies though. The decision is even weirder when you consider that they are making a Persona 4 Golden series so soon after releasing the P4 anime. If they were going to do that I would have preferred a P3 series and P4 Golden movie.